Wait just a minute! If someone who is being attacked pulls a gun and kills the attacker, is this evidence that guns save lives or that guns take lives? Or is it a statistical toss-up? The author tells some truly gripping stories of armed self-defense here, but he would have been on more logical grounds had he dropped his oversimplified title and gone with the subtitle alone. As a collection of cautionary tales by which readers can imagine what it would be like to be menaced by bad guys, this book has much to recommend it. It is colorfully written and fast-paced; the characters-both good and evil-are sharply drawn; and the tone is generally more reportorial than strident. But as a serious inquiry into the social benefits or costs of private gun ownership, the book is lopsided. None of Waters’s stories is about guns that discharged accidentally and killed innocent people or those that were snatched up on impulse to wreak domestic violence or facilitate easy suicide. 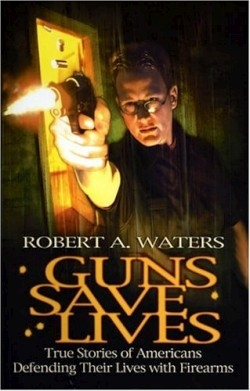 In each of the twenty stories, Waters demonstrates beyond reasonable argument that the persons being attacked were fortunate to have access to guns and were completely justified in using them. He also makes it clear that these self-defenders are not trigger-happy zealots with chips on their shoulders but normal workaday citizens. Some seem to feel exhilarated at having done what was necessary to protect themselves. Others see their triumphant shootouts as proof that gun-control laws should be resisted. Waters holds a Master’s Degree in Rehabilitation Counseling from the University of Georgia. He has written articles for the Detroit News and the Ocala (Florida) Star Banner, and his previous book, The Best Defense, was published in 1998. A skillful interviewer, Waters extracts from his subjects a wealth of useful details. By showing a too-often-overlooked side of the gun-control debate, and by giving it a human face, he has made a substantial contribution toward clarifying an issue that holds no easy resolution.